Custom electro-less nickel-plated brass fittings allow connection to a threaded pipe, tube or other fitting. The push-in design provides simple assembly and disassembly, while the flange or barb maintains a secure union. Size and style are determined by the cup. Please note that 10-32 male threads are fully compatible with M5 female threads. The design of the Captured O-ring Barbed Fitting combines the reliable mechanical fit of a metal-to-metal connection with the unmatched static sealing qualities of an O-ring. Proper installation of the fitting allows the skirt around the O-ring to mechanically seat on the rim of the female thread, holding the fitting tight. 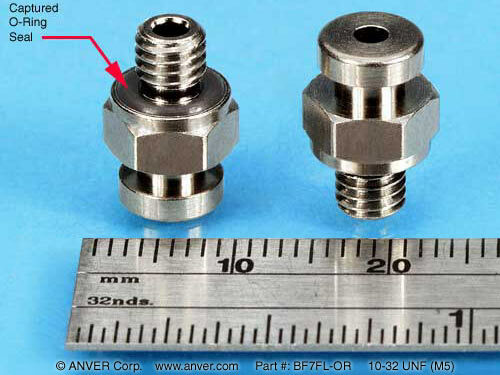 A clean looking connection is achieved by concealing the high quality Buna-N O-ring from view inside the skirt of the fitting. The Buna-N O-ring is thus compressed, not pinched, within the fitting skirt ensuring a leak-proof fit even when mated with a less than perfect sealing surface. The mechanical fit keeps the fittings tight and retains its position even under constant vibration or movement of our SLSA Level Compensators. Our captured O-ring design eases installation and eliminates the need for replacement gaskets or washers as the seal is already in position. The seal is kept tight minimizing unnecessary vacuum loss.